Using concrete as a building material dates back to 200 BC when Romans used it to bind stones together. At one stage in the evolution of concrete blocks, between about 1900 and 1920, molded blocks were cast right at building sites to the specifications and quantity deemed by the designer. This type of production allowed for a wide variety of sizes and textures for the face of the block, the other sides smooth and easy to install. Often itinerant crews went from village to village offering their services, sometimes contractors owned or hired block making companies of which there were dozens all over the province. Schools, houses, commercial buildings and the occasional church were constructed of molded concrete blocks. Emerson Baptist is an excellent and rare example. Winnipeg architect Hugh McCowan drew up the plan for the church. 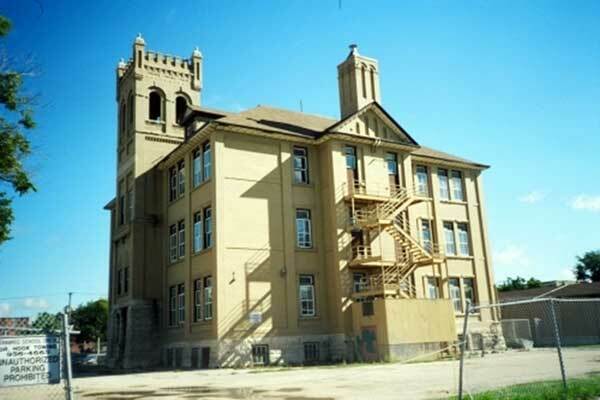 Among McCowan’s other designs are the Kay’s Building on McDermot and the Stovel Building on Princess in Winnipeg as well as several schools in rural Manitoba. The contractor who built Emerson Baptist was well-known in the area. 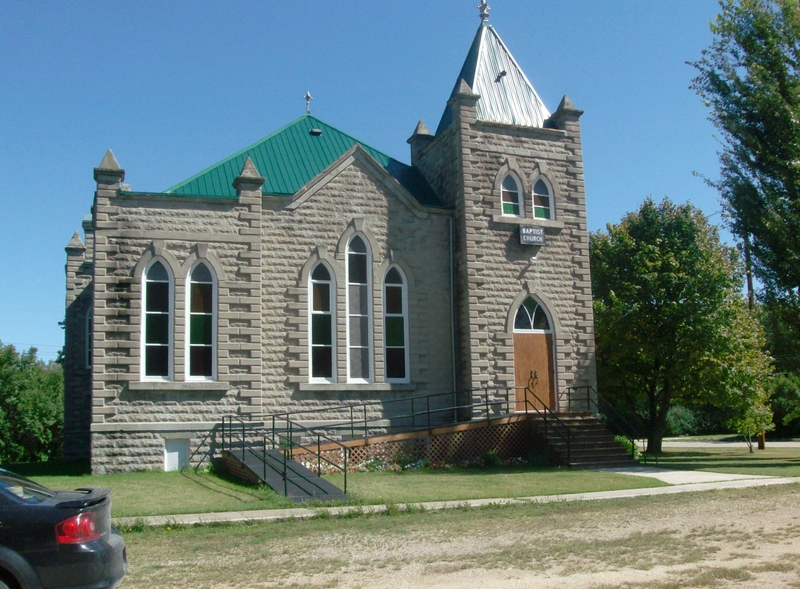 David Wright, one-time mayor of Emerson, constructed the church in 1905 from concrete blocks made on site. Several sizes of blocks compose the church. Mainly elongated blocks with rough surfaces to simulate actual stone were used in the body of the walls. Smooth long and short blocks accentuate the corners, all openings and string courses. The contrast between the textured and smooth blocks is pleasant and settling. The front facade has three increasing heights that begins the sensation of ascension. The pyramidal caps on the elevated corners, the elegant gable along the cornice above the triple narrow windows and the corner entrance tower with its steep roof topped, as are all roof peaks, with an elaborate pinnacle complete the ascent. It’s a beautiful choreography of your attention that flows naturally all the way to heaven. About the roof, I am generally not much of a fan of metal roofs. This is purely aesthetic and rather moody on my part but I do get their value: long lasting, durable, low maintenance and effective – they keep the rain off the hymn books. In the case of Emerson Baptist, the green metal roof deters little from the overall building. Though appealing, the church’s roofline is not its main feature. 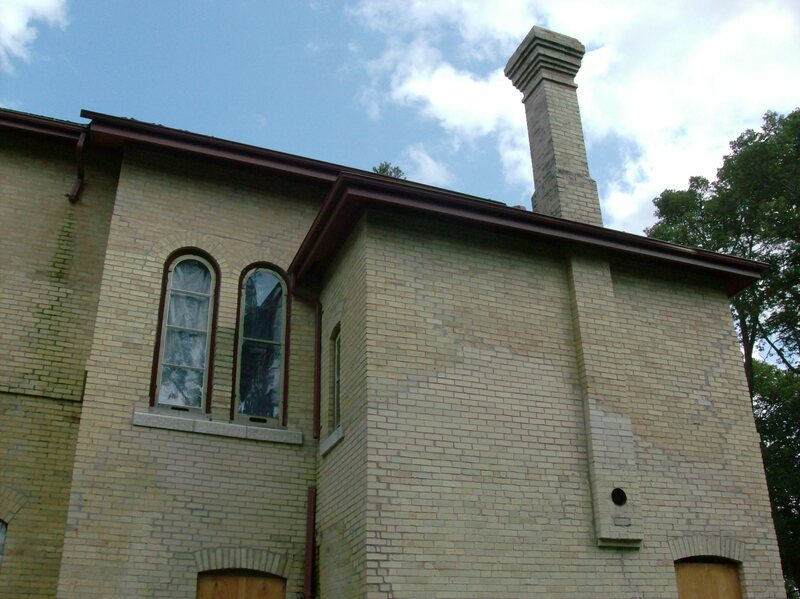 The windows and main entrance are peaked in the Gothic Revival style, each peak blunted by a keystone. The smooth surfaces used around the windows and front entrance have an interesting relationship with the quoins on the corners, a major feature of the detailing. Glass panes are multi-hued. In this picture you can see the ivied wall and the carved pinnacles atop the three roof peaks. Emerson Baptist is one of the heritage sites where I shot a copious amount of pictures. Watch my 2:01 video to see it from its many wonderful angles. 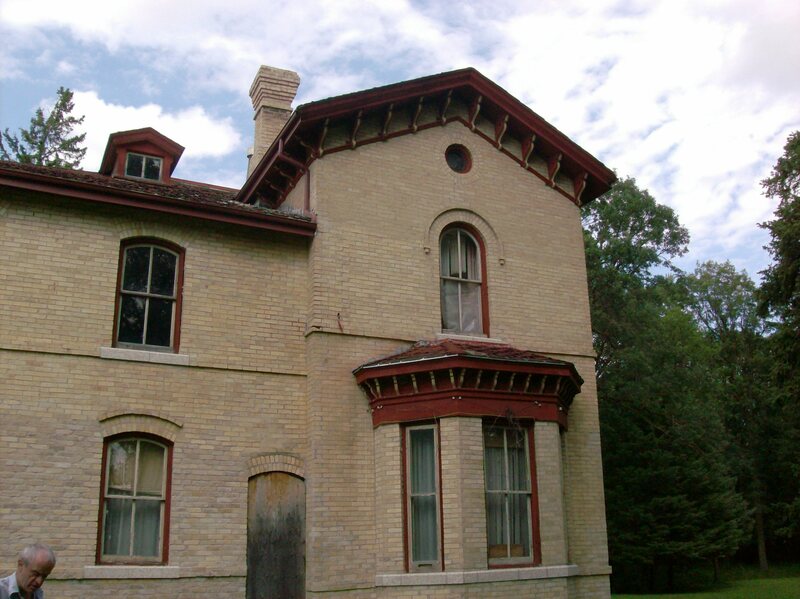 Another Italianate beauty in southern Manitoba! 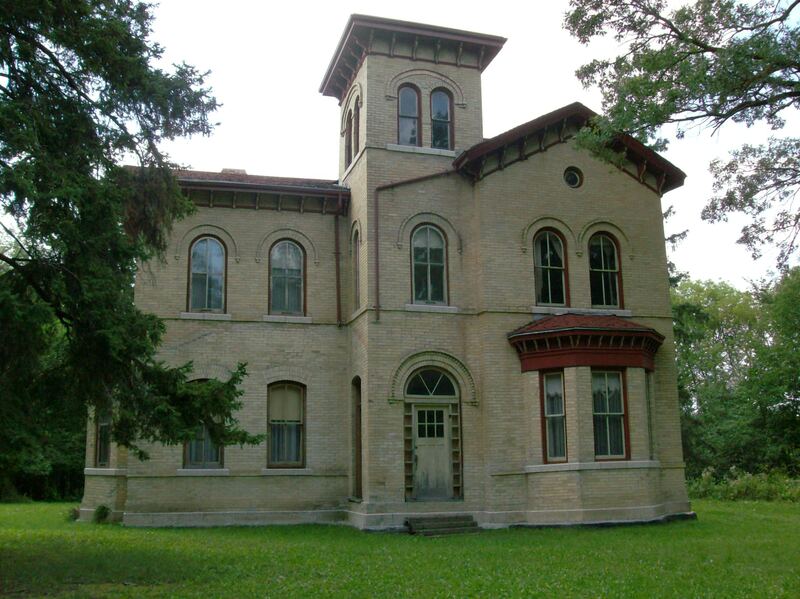 Built in 1880-81 on the north side of Emerson between Second and Third Streets, lawyer, real estate broker and municipal official William Newton Fairbanks spared no expense constructing his mansion. 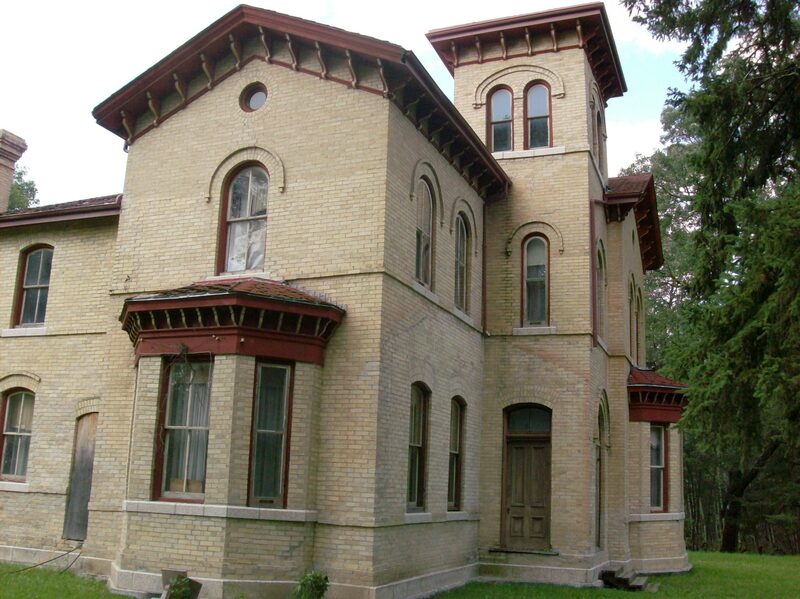 A true and wonderous example of the Italianate Villa Style, which was just becoming popular in North America, the pile sports low-pitched roof, tower, extended eaves, arched windows, angular bay windows and a sense of Mediterranean wealth. Constructed of “Emerson” brick – distinctive yellow brick with pink undertones – produced in Emerson’s early brickyard. 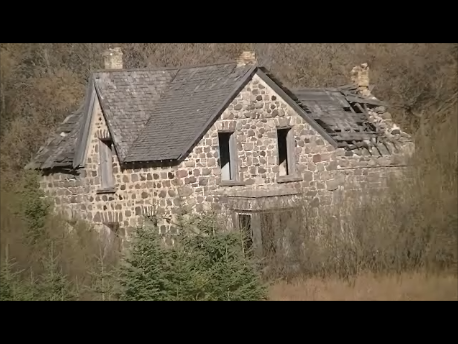 The house had been the residence of the Forrester family for over 100 years. Today it stands empty and unprotected by any kind of historic designation. 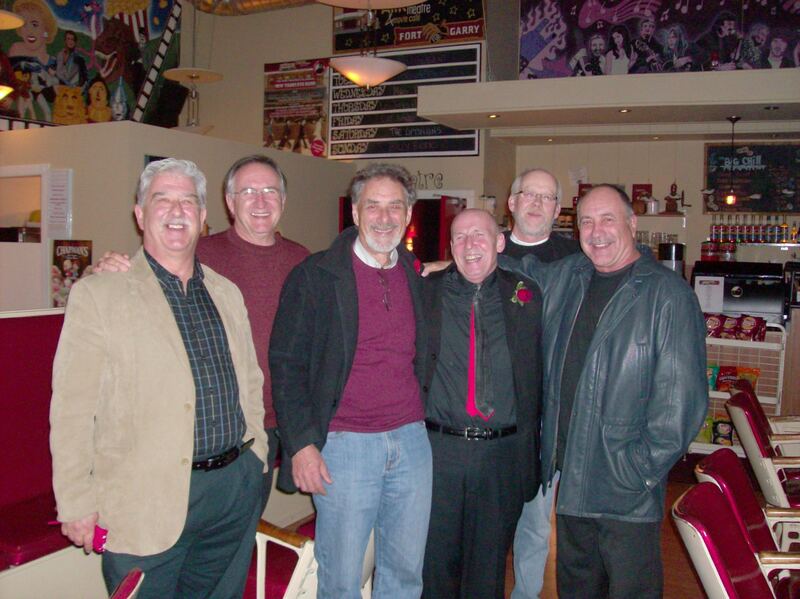 I begin my year-end review with a picture taken New Year’s Eve 2009, one week after Linda died. Snapped by dear Kenny at his celebration, people who saw the picture thought Leonard Cohen had attended the party. Alas, it is I, the horrors of the recent past inscribed on my face, a small attempted smile, sad eyes. Since Leonard Cohen is 14 years my senior, I guess I got a little behind in my Fountain of Youthersize. I will conclude my year-end review with a picture from New Year’s Eve 2010. When a good person dies, their benevolent energy is released into the world. It hovers nearby, surrounds those the deceased loved and provides angels to ease their grief. Evident angels bring casseroles and pies. More subtle angels appear seemingly by coincidence. You can recognize them because they always turn up in a timely fashion and they always know what to do. Travis was one of Linda’s angels. 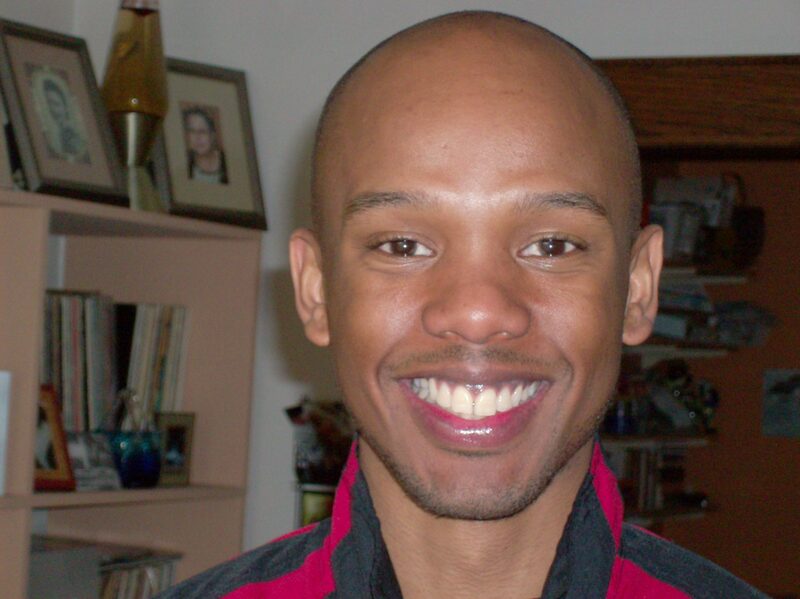 A licensed massage therapist, Travis was recommended to me in early January to iron out the tension and kinks my body had accumulated over the past few months. The moment I saw Travis I knew he was an angel, an Old Soul come to help. That day I received the best massage of my life. He knew what to do, what I needed. The subsequent seven massages he gave me became increasingly healing. While I tried to come to some kind of reckoning with my state of shock after Linda’s death, Travis kneaded and stroked grief out of my body with kindness, compassion and love. His hands found the pain of grieving my body held and gently, with coordinated breathing, released it, leaving me more relaxed than I’d been in months, unbound, at home in my skin again. It is a luxury to be understood. Not only did Travis recognize the needs of my body by relieving its tension, he realized my mental condition and offered solace of the most intense kind. Soul to soul, a bond formed between Travis and me that silently acknowledged the pain and the process required to survive it. In that bond, hope took root, was nurtured, grew and helped me immensely with proactively processing my grief for Linda. Travis. Can you see the light behind his eyes? Click any picture to enlarge. Travis showed me grief wasn’t new to me. I had grieved for parents, grandparents, aunts, uncles, cousins, friends and pets in this life and others. Death is necessary. We are all tomorrow’s food. Grief ensues. I knew the territory and I knew the steps. I printed off the 10 steps of grieving, tacked them up at my desk and used the list as a map to figure out how to get through this. Travis returned to Vancouver in late March to his family and to pursue his career there. We have kept in touch in many ways. I have a feeling Travis and I will be reunited soon and he will again act as a catalyst to propel me fully into my new life. The distance: just over 27,000 kilometres in 6 months from mid-May to mid-November, averaging 150 kms a day all over southern Manitoba and Saskatchewan. 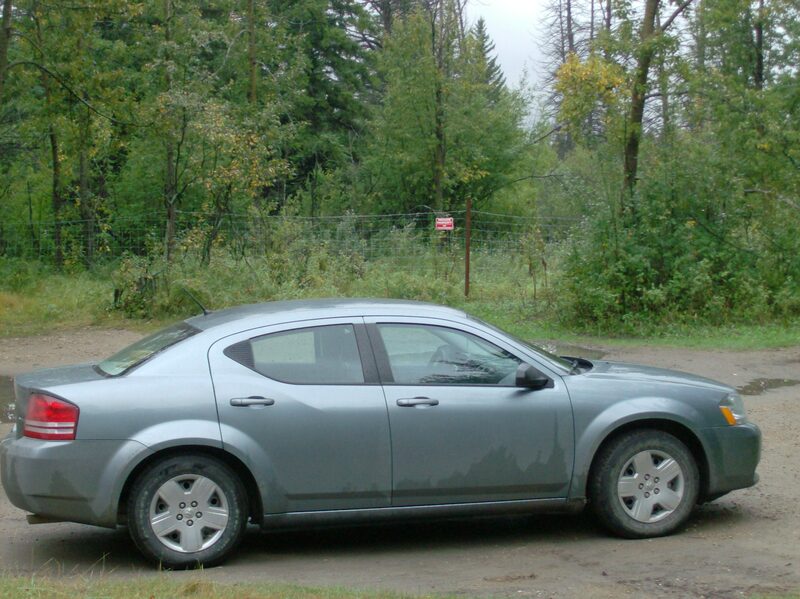 The vehicle: The Mighty Dodge Avenger. 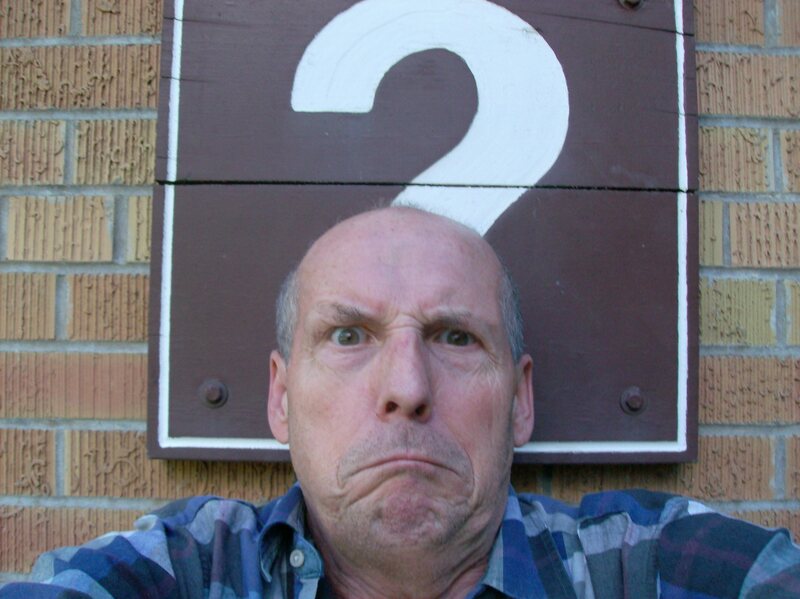 I am proud to report that at age 61 I have never owned a car or any motor vehicle in my life. I drive but choose not to. I am independent. This summer I needed to be mobile, to escape this hive and haunt the blue dome that nurtured and inspired me growing up in little Shoal Lake. I needed the elbowroom, the mental room to deal with my grief over Linda’s death, to run the grieving steps in a wide-open space that I knew and that knew me. Enterprise offered me a great deal on a month-to-month rental with plenty of free kilometres. I could not resist and didn’t. The Mighty Avenger arrived in my life. A little sporty, a little daddy, peppy and utterly reliable for the ensuing thousands of kilometres we spent together. We were a team. The Mighty Avenger at Pine Cree Park, SK, the farthest west we traveled this summer. At the end of July, Mother Enterprise decided the 2009 Avenger had reached it rentability zenith and was ready to be sold, put out to pasture. Just like me! A lovely irony! I will always cherish and admire how the Mighty Avenger easily contributed to my personal mythology as I created a new life for myself, how every mile it accommodated Linda’s spirit and all the wild spirits we found along the road. We’d been comrades in kilometres from Bannock Point Petroforms in the east to The Convent B&B in Val Marie, SK in the west. We’d driven PLP to Wpg during the Once In Fifty Year rainstorm in late May, basked in the heat next to an ancient dancing ground at the top of the highest hill around, maneuvered the blind hills and vales of the Missouri Coteau and the sharp curves of the Canadian Shield with aplomb and dodged most of the gophers we encountered. After traveling 1800 km with me in the Avenger and driving part of the way, my friend Chris can attest that the Avenger is a most amicable driving machine. The Avenger is a mighty sweet ride! Arriving at Enterprise, I turned in my reliable friend, anxious about its replacement. 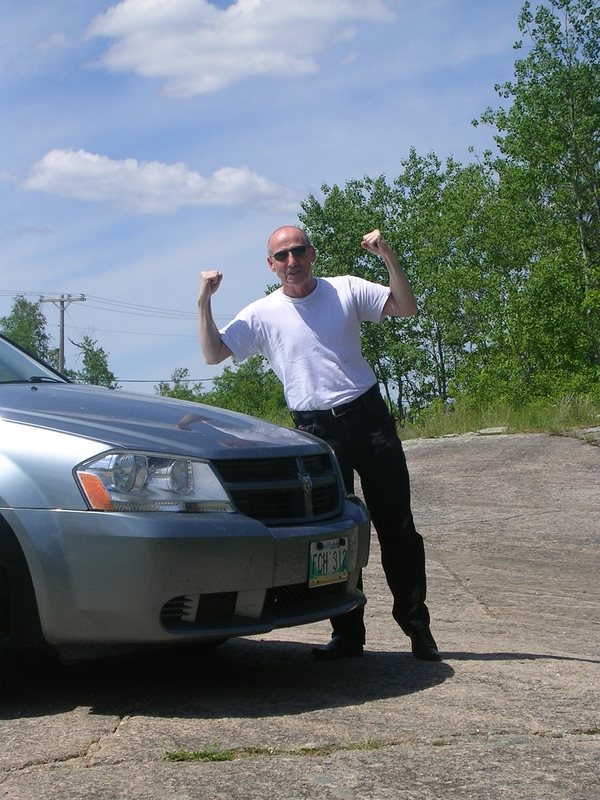 The Mighty Avenger and I stopped on a tablerock on the Canadian Shield. However, after six months and one week, it was time to say adios for good to the Mighty Avenger. I had extended the rental for three extra months and never regretted a mile of it. Over the summer, I kept all the gas receipts from the Avenger but never totaled them. I waited til just before I gave it back to add them up. Not to say it was hard on gas, it wasn’t but the whopping total made our parting much easier! My friends keep asking if I miss the Avenger but I don’t. I enjoy the slower lifestyle, the pace of walking, being patient, it’s familiar. I do miss one thing about it though: hearing the great break in “I’ve Got You under My Skin” by Frank Sinatra, arranged by Nelson Riddle, really loud going 110 kms an hour down a perfect highway aimed at the vanishing point. When traveling any path, it is essential to have as many allies as possible in as many different worlds. I am blessed to have my young friend Chris as a spiritual ally. We’ve been friends for 12 years, grown together spiritually, traveled together, aided and abetted each other’s development and personal evolution. We are Old Souls, the ones who find each other in times of need and know what to do. 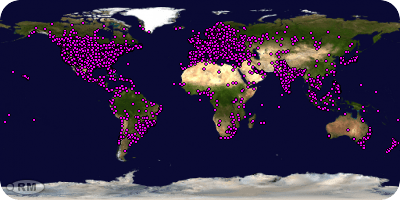 If you have followed 12 Sacred Places, you have heard of Chris often enough to make you curious about him. In addition to being an effective and respected therapeutic drummer, imaginative musician, Old Soul and a fine writer, Chris is a deeply spiritual man. He is an embodiment of Universal Love. It shines from his eyes. Time and again when we talk of our lives and our challenges, Chris distills everything to Love for which he is a positive change agent and future attractor. His smile inspires hope. Over the years we’d discussed traveling together to the sacred places I told him about. This was our year. Starting solstice sunrise in June (Day 6 of 12 Sacred Places) we spent five blissful days together on the road, traveling through southwestern Manitoba into southern Saskatchewan visiting a dozen ancient places, contacting local spirits and getting grounded. Total kms of shared driving:1867 kms. To have an intent then watch for both the intended and unintended to occur is the heart of every sacred journey. Chris and I began our June journey with a simple intent: to humbly visit sacred places seeking grounding and discovery. Although I had driven this path many times, the journey was new to Chris, but being Old Souls, together we cleared the path to our intent. The journey gave both of us the clarity, courage and strength necessary to deal with our life changes. Sometimes Chris liked to get out and run along side the Avenger. I always waited for him to catch up when I left him in the dust. 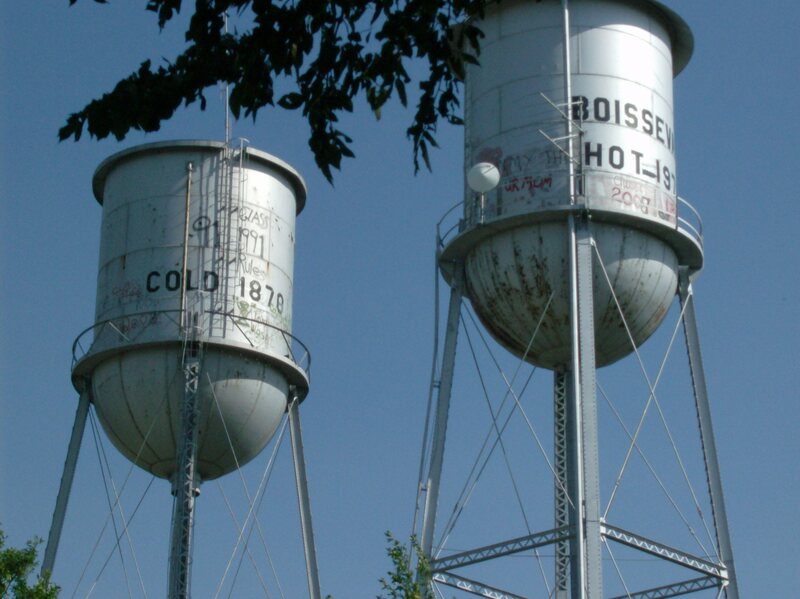 The town of Boissevain, MB in the southwestern part of the province is served by twin water towers, the tallest things in town. Of course, one is hot, the other cold, as you can see. Manitoba highways are still superior to Saskatchewan in some areas. The best road was MB Highway #68 west of the Lake Manitoba Narrows. Smooth and easy, no patching and few winter lumps. Infrastructure cash flowed like water this summer with highway construction around every corner of my travels. Brand-new sections of TCH between Portage and Brandon are so smooth they resemble runways and flight feels inevitable. The worst is easily SK Highway #18 which I drove three times this summer. Seemingly, I just couldn’t get enough of it. Along the US border west of Estevan the highway dissolves into something the road map calls “thin membrane surface.” It means 100 yards of gravel, 100 yards of broken pavement, 100 yards, of not so bad pavement, back to gravel, no gravel and so on for miles and miles. Some of the most spectacular scenery in Saskatchewan, a dozen ancient holy places, constantly changing landscapes and geology and a broad assortment of rural eccentrics can all be found along Hwy #18 but I still don’t recommend driving it. You can deek in and out of many of these places from much better, more drivable Hwy #13 to the north. 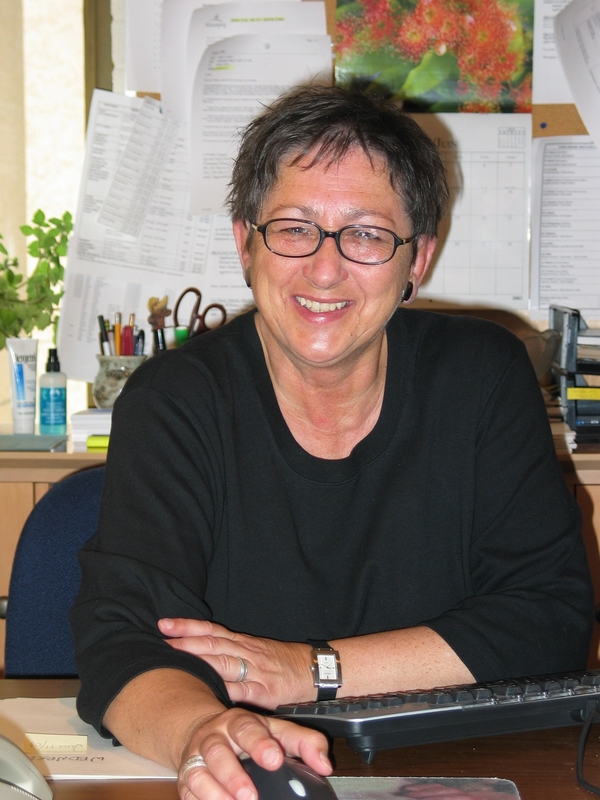 On my second visit to Val Marie, SK in August 2001 I met a local woman named Lise Perrault. Besides collecting original volumes of western writer Will James and offering interesting well off the beaten path tours of the mysterious Frenchman Valley, Lise was a painter with a unique folk art style. Her depictions of the prairie she saw every day and the critters who roamed it brim with simple honesty both in subject and style. Lise is in a personal care home now and her paintings have largely disappeared or been sold by her family. Today the Val Marie Museum retains two of Lise Perrault’s most evocative works. 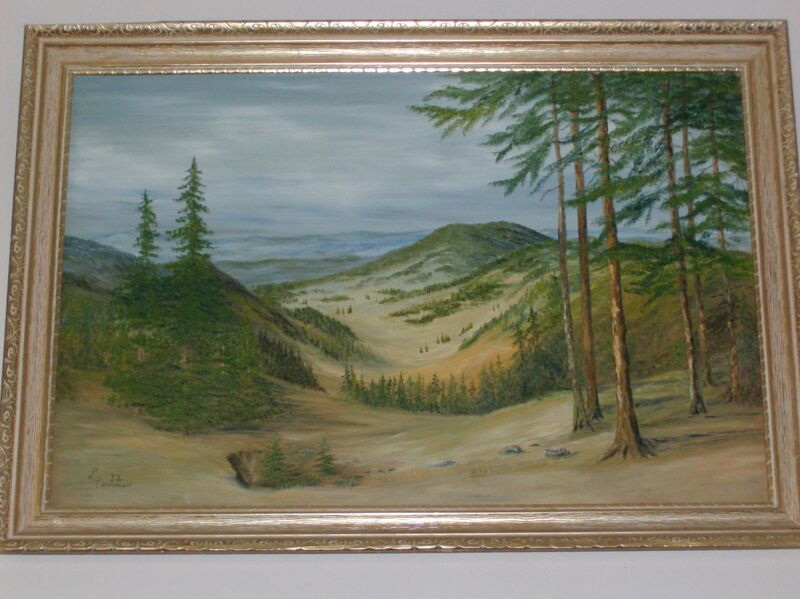 Painted in 1982, one is a hilly and treed vista that may have been the lowlands of the Cypress Hills just west of here. 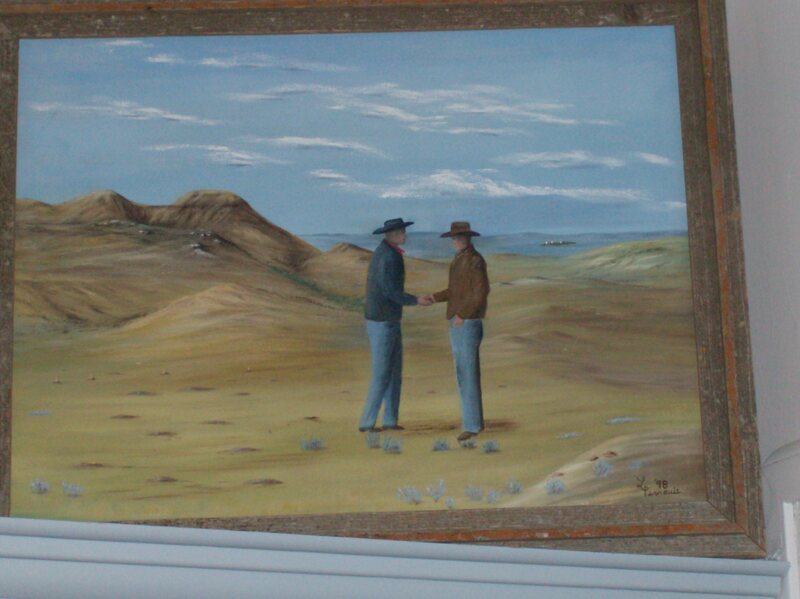 The other, from 1998, depicts two cowboys shaking hands in the middle of the prairie. Nothing in the picture suggests the men’s motive or meaning, no points of reference. There is amicability between them but mystery as well. It made me think of Brokeback Mountain, Annie Proulx’s well-spun cowboy story. Proulx writes mainly about Wyoming and Wild Westerners, so Val Marie, with its similar landscapes and lifestyles, could well have been a place she visited, saw Lise’s picture and got the notion for Brokeback Mountain. I asked several people in Val Marie if they knew of a visit by Annie Proulx. No one had. I’m probably just adding on here. I stayed in 30 different hotels, motels and inns over five months this summer, returning to a few of them several times. Quickly I realized there are two completely different business plans going on in hostelry. Most of them rent rooms for people to sleep in. Sounds right, what they do. A few others, the really good ones, sell sleep. They rent rooms too, but they also sell sleep. Big difference. That accounts for the hundred-dollar price gap between the Ramada Inn in Weyburn and Barney’s Motel in Brandon. Ramada in Weyburn is Best Accommodation of the Summer thanks to their $4000 Simmons industrial mattresses that feel like you are being held in the hands of God, stylish and sophisticated décor, pool and hot tub, great continental breakfast, tremendous highway and railway view and a good night’s sleep. Also in Weyburn, the Canalta Inn is a runner-up. Next door and related somehow to the Ramada, Canalta Inns, an Alberta company with hotels in the three western provinces, offers almost comparable accommodation including a hot tub and wonderful wet steam room. They, too, are selling sleep. 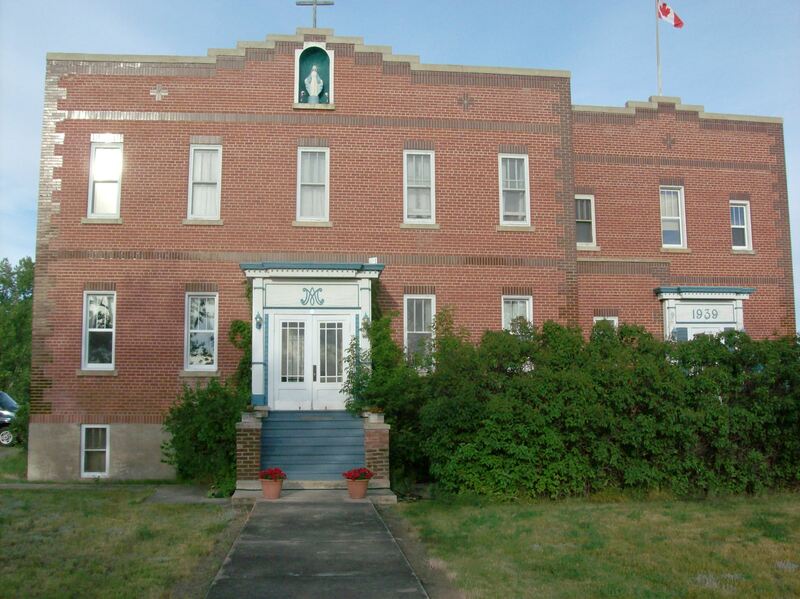 Adding charm to the mix, I recommend The Convent Country Inn in Val Marie, SK. An actual convent, saved from demolition at the last minute, is now a serene yet playful bed and breakfast run by wonderful people. I first met Robert and Mette Ducan over ten years ago not long after they had opened their venture. With years of experience behind them, they are expert hoteliers now. Here is a hot tip for recent empty nesters ready to take on a new adventure: The Convent is for sale! The all-in price is reasonable and the location exceptional. This is a Do Not Miss opportunity. Investigate. A shoo-in, a hands-down winner for Worst Accommodation of the Summer: Miniota Inn, Miniota, MB, a shrinking village at Highways #83 and 24. What makes it a winning loser? Let me count the reasons. Comprised of either six or eight seedy rooms, the joint is just an excuse to have a pub to service the eight local alcoholics all of whom howled late into the evening. The room reeked of cigarette smoke and when I asked the guy at the desk, so to speak, for non-smoking, he said, “Oh, everybody smokes.” Ah, I was in the wrong town. Nonetheless, I stayed the stinking night on a flat saggy mattress below a rendering of Michaelangelo’s Creation on black velvet (truly) which was not bolted to the wall yet survived pilfering, that’s how bad it was. Adam appeared to be wearing jockey shorts. I wondered what velvet delights haunted the other rooms of Miniota Inn and shivered. Wait! There’s more. Miniota Inn wins again! A double winner! Add in Worst Restaurant Service of the Summer! My evening meal in their restaurant was reasonably easy and edible, breakfast more of a challenge. A hobbling, elderly man, I guessed in his mid 80s, was the morning waiter and cook, again so to speak. Morning clientele consisted exclusively of working and retired guys getting away from the wife and kids early to spend a few minutes of mindless camaraderie with men of similar destiny. The demands of the morning men were simple: coffee, cream, sugar. Luckily, for the waiter coffee is self-serve at the Miniota Inn giving him time to sit and wheeze. When I ordered toast, a completely new order of expectation, confusion and amusement kicked in. I eventually made my own toast when he brought out the toaster for me to use. This is somewhat of a default win for Worst Service since I thought the toast I made was just fine and I smiled when I brought it to my table. Wait! Even more? Yes! Miniota Inn is a triple winner! Not only was the inside ambience and décor of my room toxic in so many ways, the view out my window was Worst View Out a Hotel Window of the Summer. Here it is. Strangely, the lawn surrounding Miniota Inn is actually a miniature golf course. This structure suspends a swinging pole over the hole (Par 3) as its challenge. I shivered imagining the view out other windows here. Nutshell: Miniota Inn – don’t stay there. 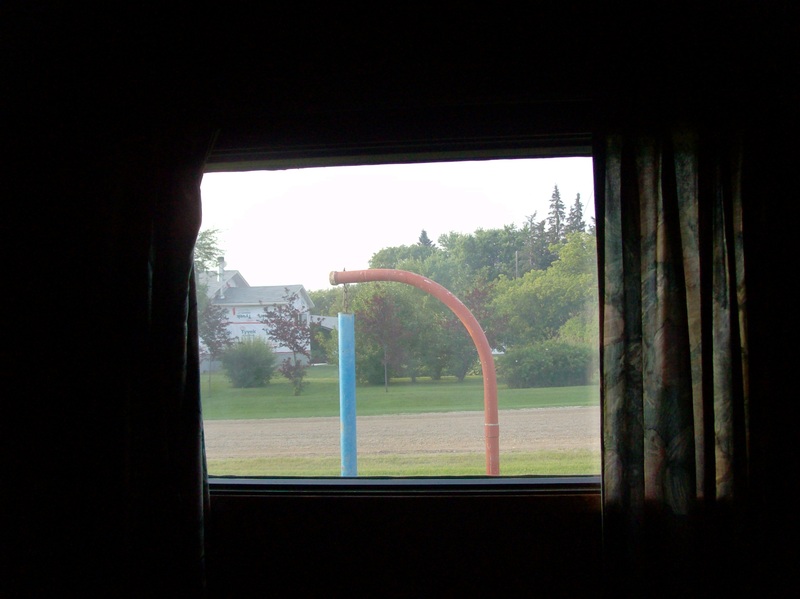 Runners-up: Barney’s Motel, Brandon, MB for the red ants in my room (Day 8 of 12 Sacred Places has the scoop on Barney’s); and Whitewood Inn, Whitewood, SK for dilapidation. The room was rumpled and over medicated. Their hot tub had a foot of what looked liked creamed corn in the bottom of it and nothing else. Their pool was jittery and toxic but alas, their dry sauna worked up a sweet sweat for a travel-weary Joe. Still, don’t stay at either of these joints. 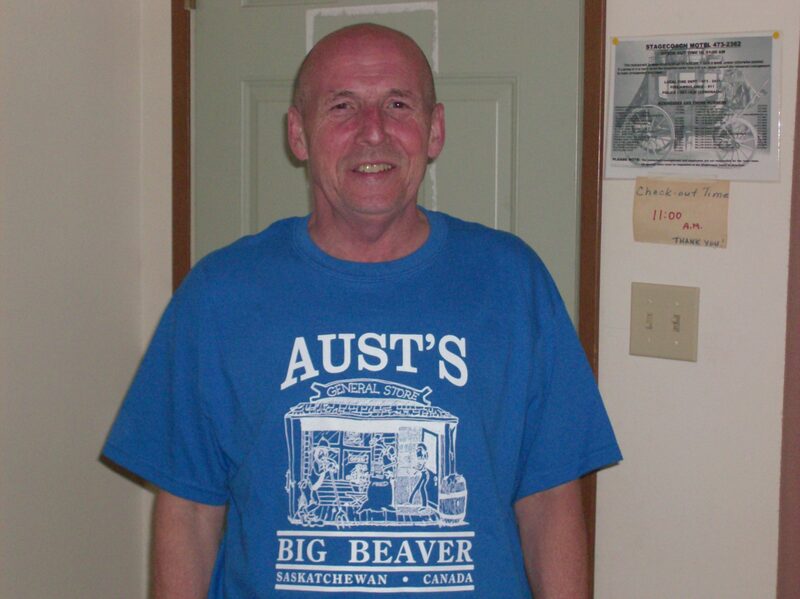 Situated SSE of Regina about 10 miles from the Montana border, Big Beaver claims a population of 20 people. At its height in the 1920s, Big Beaver boasted 300 people, a six-room schoolhouse and four grain elevators, including, in 1925, the biggest inland grain terminal in the British Empire. Today, serving the hamlet and area is Aust’s, a classic country general store. Their motto is “If we don’t have it, you don’t need it.” Aust’s, one of two businesses in Big Beaver, offers the full gamut of merchandise. Groceries, farm supplies, stationery, clothing, garden supplies and a myriad of merchandise fill three large joined wooden buildings. Each room has its own distinctive odour, rich and rural. There is even a “coffee shop” with classic advertising and a few locals who love to jaw with strangers. My first of three visits to Big Beaver was in June with Chris. As we pulled up, I commented we would buy something completely unexpected and we did. See us sporting our new Big Beaver t-shirts. This sign has a nostalgic meaning for me. 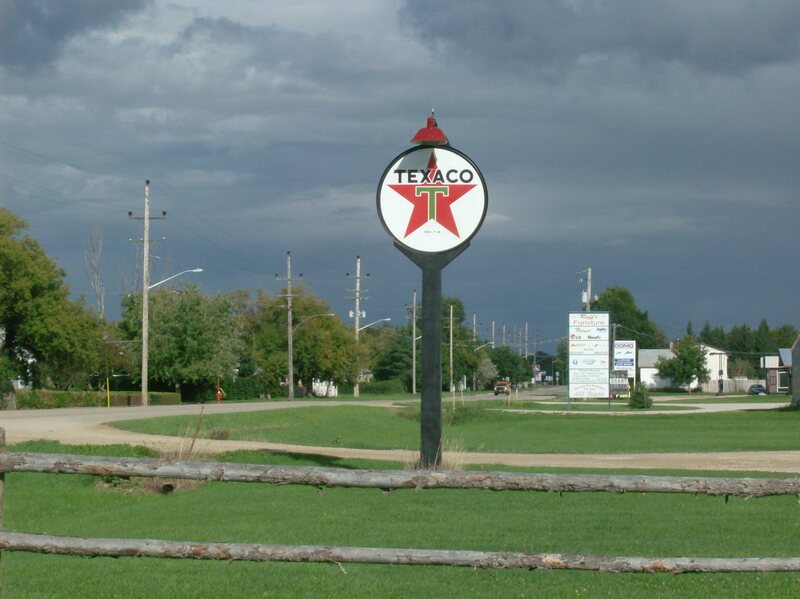 My dad was a Texaco consignee (he delivered gas to farms and stations) for 10 years in Shoal Lake, MB. I grew up there and worked with him, even delivering fuel myself when I got my license. Dad wore a Texaco uniform and cap that featured the big red star with the green T emblazoned on the white circular background. The slogan of the day was, “Texaco. You can trust your car to the man who wears the star.” I saw this perfectly restored sign in front of a business on the outskirts of Dauphin, MB with the threatening sky beyond. 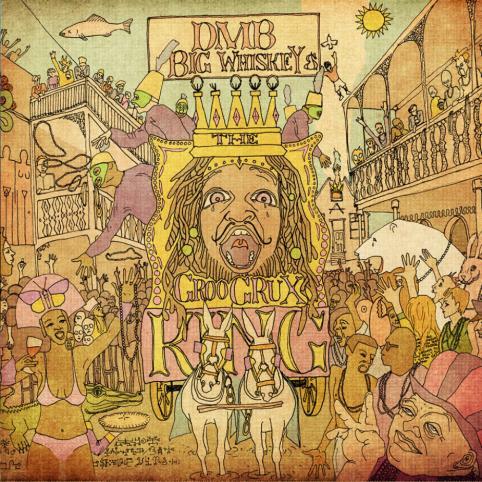 Big Whisky & the Groo Grux King is Dave’s best music in 5 years. No matter who or if anyone sat in the passenger seat, Linda rode with me every mile this summer. We developed a loving contraction, for lack of a better term, where she watched over me, softened my loneliness, understood what I needed to do and believed it would be done. Webbed Flight, my spirit helper and guide, traveled most of those miles with me as guardian, less for me than for deer on the road. If I was approaching a deer, Webbed Flight gave subtle but firm notice of it. I dodged three deer that way this year. Sometimes he even predicted roadkill deer. Some of the sacred places resonated deeply for him. In addition to Chris, I was blessed to have several other organic beings share the road with me this year. Old friends joined me on some of my jaunts about this summer, like Terry, dear friend from my hometown. Together we explored eastern Manitoba in the Whiteshell and Pinawa area. I have known Terry for 50 years, both of us are mostly retired and we “pick blueberries,” our name for driving around, getting out of the car, exploring and just generally living. Easy company, fine sense of humour and long shared history make Terry a welcome passenger anytime. 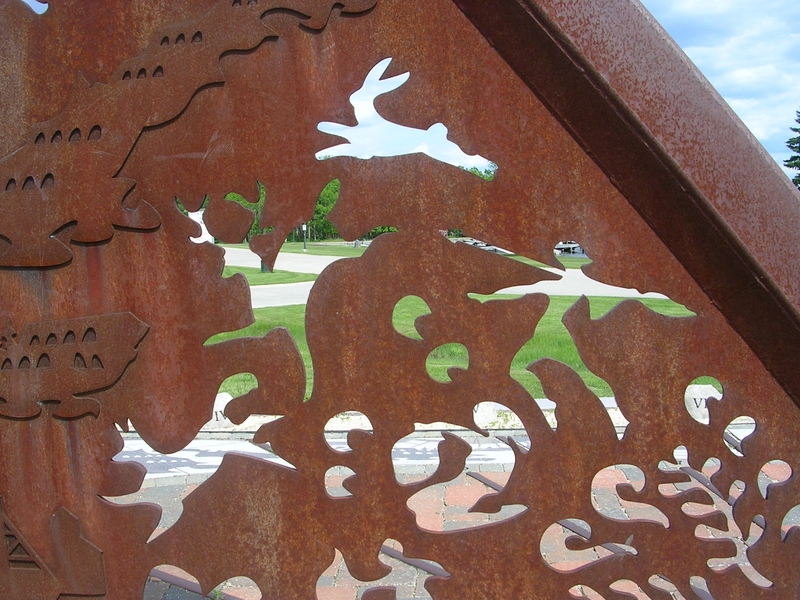 This is Terry’s picture of a metal sculpture in Pinawa. My good buddy Mitch comes from Emerson, MB (named for Ralph Waldo Emerson), which I had never visited til this summer when he gave me the guided tour one hot August afternoon. With his great memory for detail, I got the inside scoop on Mitch’s youth in his little town. It felt very similar to my upbringing in a similar environment, familiar, friendly and warm. 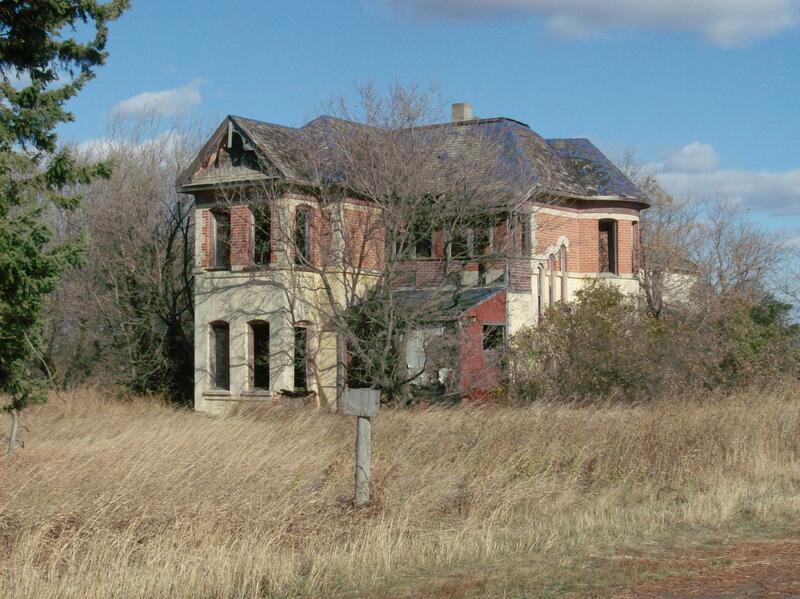 We visited historic site Fort Dufferin, or the remains of it, just north of Emerson on the banks of the Red River. The site resonated strongly for both of us. Mitch’s diverse background meant he had a story about something along the way nearly every mile. We explored north as well, venturing out to Hecla Island, which was new to both of us. Very enjoyable company with fascinating stories. Another friend from my youth, Susan, met me for lunch several times in Minnedosa, MB this summer. We ventured into Brandon one Sunday for lunch then toured around south of Brandon where I first lived. Sharing comparable life situations, it was terrific to have her company, familiar and easy, comforting and true. Off by itself under a tree in Rounthwaite Cemetery southeast of Brandon I found this simple epitaph. No, this isn’t Ken Wilber. 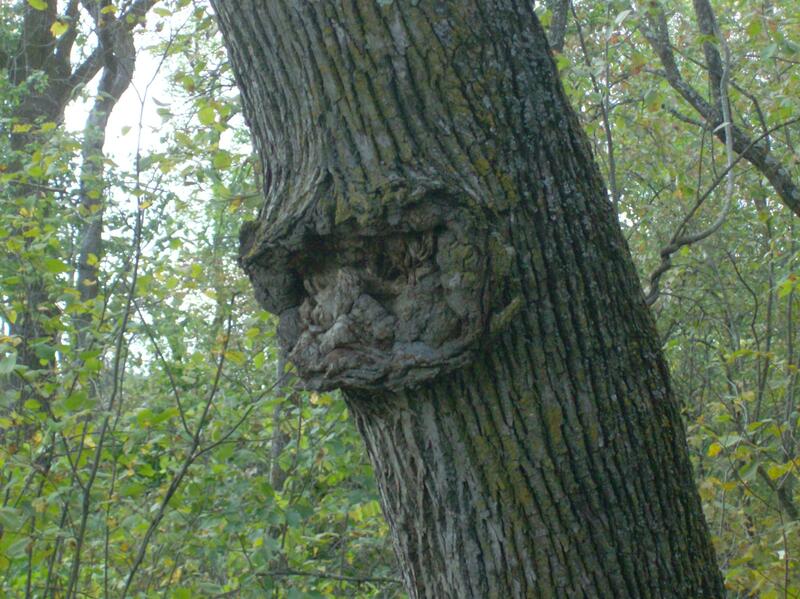 It’s a large knot on a tree bending toward the trail around Marsh Lake, an oxbow of the Assiniboine River in Spruce Woods Park, MB . Linda and I discovered this on our first hike there years ago. Pucker your imagination a little and it looks like a face, the North Wind in fact blowing down the trail! 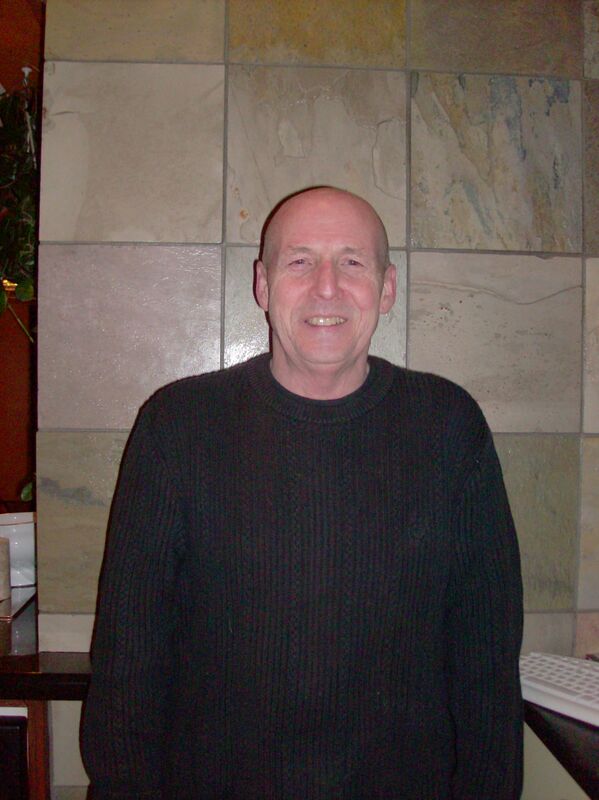 I just couldn’t review the year without mentioning Ken Wilber. Done. You can watch Ken stop his brainwaves on my blogroll. You really can. Similar reason to mention: Bill Hicks. Honouring and memorializing my beautiful Linda took three significant forms this year, all of them tremendously satisfying and healing for her friends and me. 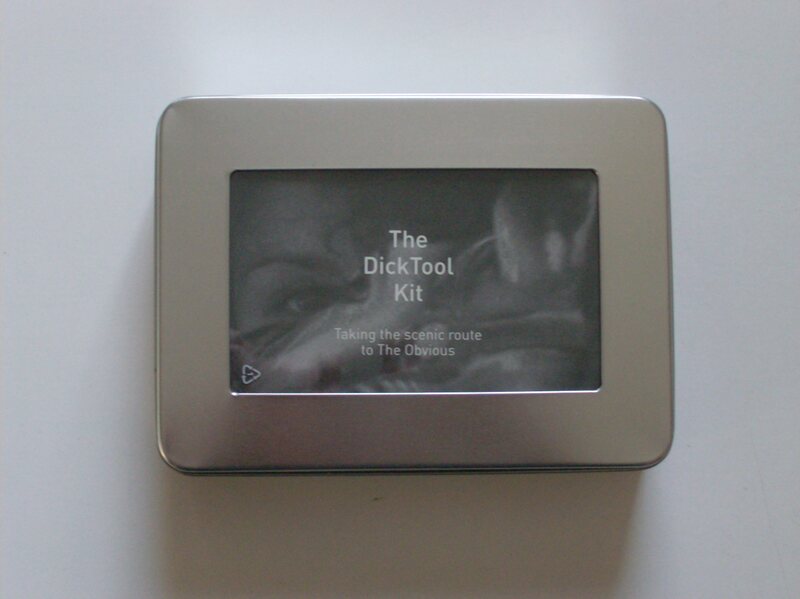 Thirty-five years in the making, nine months in production, The DickTool Kit, a compilation of Super 8 film, video and audio created between 1976 and 1984 by Linda Tooley and Reid Dickie, became reality this year. Linda and I had often talked about putting the old video art we did in our youth onto a DVD and giving it to friends. The actual DickTool Kit turned out to be more comprehensive. The limited edition of 100 Kits wound up consisting of four DVDs, one CD, a 64-page book I wrote describing The Kit’s content and some memorabilia from IF…, our vintage clothing store, all tucked into a metal box. Over six hours of DickToolery! Operating both as an archival project and homage to beautiful Linda, The DickTool Kit celebrates us when we first fell in love and how we used the enormous creative energy our union ignited. 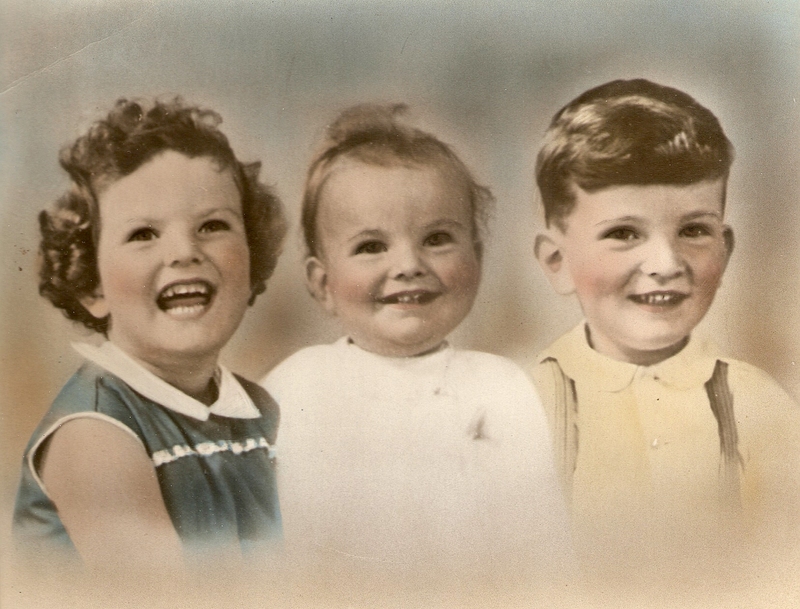 As it says in the accompanying book, “These are the images we chiseled onto the cave wall and lit with a tiny flickering fire.” How wonderful to be able to share them with our friends and family decades after they were created! I first approached Video Pool, the Winnipeg artist-run video production studio, about converting our analog video tapes into digital files on February 3, 2010. Rick Fisher, technical head of Video Pool, was open and very responsive to the idea. My good fortune continued when a young technician named Nicole Shimonek offered to work on the project. Together Nicole and I spent 73 hours in the studio over the next five months viewing, deciding, tweaking and digitizing the DickToolery on the tapes. After we created master copies, the DVDs and CD in your Kit were printed and duplicated by Ironstone Technologies who came highly recommended by local musicians and artists. I was not disappointed. Bryan Buchalter and his crew did a fine job. I had considered various materials and styles as the Kit’s container but it was love at first sight when I saw the windowed metal box at Mayer’s Packaging. Although slightly larger than I needed, the metal box eventually offered a snug fit for the DVDs, CD and book with the addition of the soft foam insert. 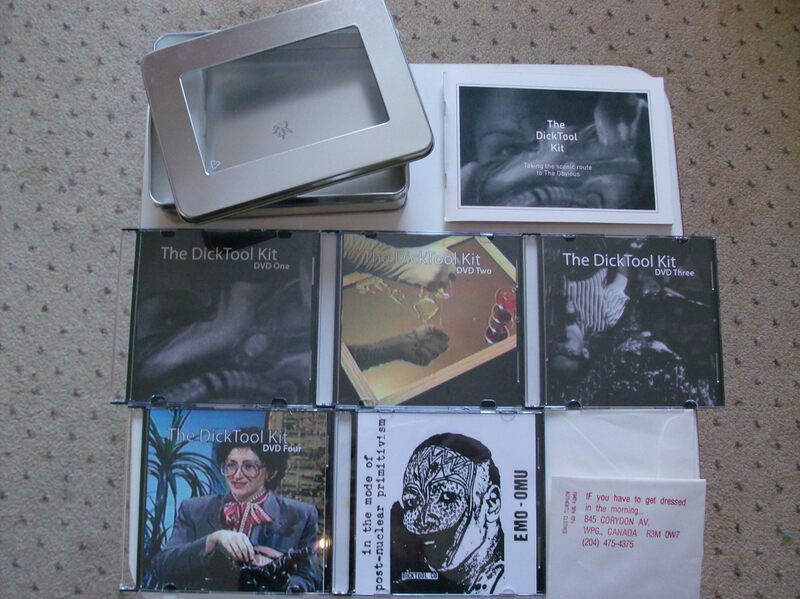 The metal box gave me the name for the compilation, as it resembled a tool kit. After several months researching through the vast files Linda and I kept about our art endeavours, I wrote the 64-page book in the Kit. The book contains details about all the individual works on the DVDs and overviews of the CD and IF you have to get dressed in the morning, our vintage clothing store. In the envelope at the bottom of your Kit you will find several pieces of memorabilia from IF… which I discovered while researching the book. The introduction to the book gives a feel for the times and the lifestyles we were pursuing. I hired June Derksen of Junebug Designs to design the book. She did a great job of retaining the aesthetic of the video works in printed form. Admiral Printing completed the book. All production services and materials for the Kit were purchased in Winnipeg. After gathering all its bits and pieces, I assembled each Kit myself by hand, numbering and signing each one. A gift to family and friends, The DickTool Kit cannot be purchased but you can see 22 of the videos from the Kit on YouTube at http://www.youtube.com/user/DickToolCo More videos will be added in January. 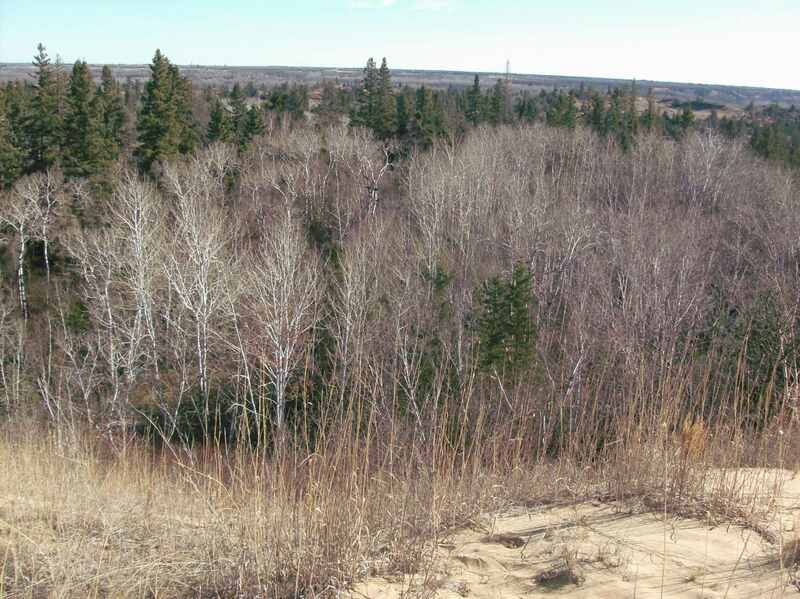 Linda’s favourite place was the Spirit Sands in Sprucewoods Provincial Park. We hiked there dozens of times over the years and discovered our special place at the top of the dunes overlooking the spruce forest below and the prairie beyond – a grand vista. This is where Linda requested her ashes be scattered. She gave me a short list of people she wanted to attend and all but three were able to come. It was hot and windy on Sunday, August 22 when we trekked out to Spruce Woods, our convoy of three Winnipeg cars meeting Linda’s cousin from Regina at the site. At the Spirit Sands, I had hired a private horse-drawn covered wagon and driver to carry us all out to the base of the dunes, below our special place. The private wagon left the parking lot of the Spirit Sands at noon and waited for us at the dunes while we did the ceremony. Covered wagon ride out to the dunes. Chris and I had done several recon missions to discover the path of least resistance up the dunes to the site. We found several routes to the top depending on abilities; some of the angles are quite steep. Usually the Sands are 5 to 10 degrees hotter than the lowlands around them. Today it’s 30 degree C with a south wind blowing, the opposite of the prevailing northwesterlies that usually shape the dunes. In spite of that, everyone made it up the dune just fine. 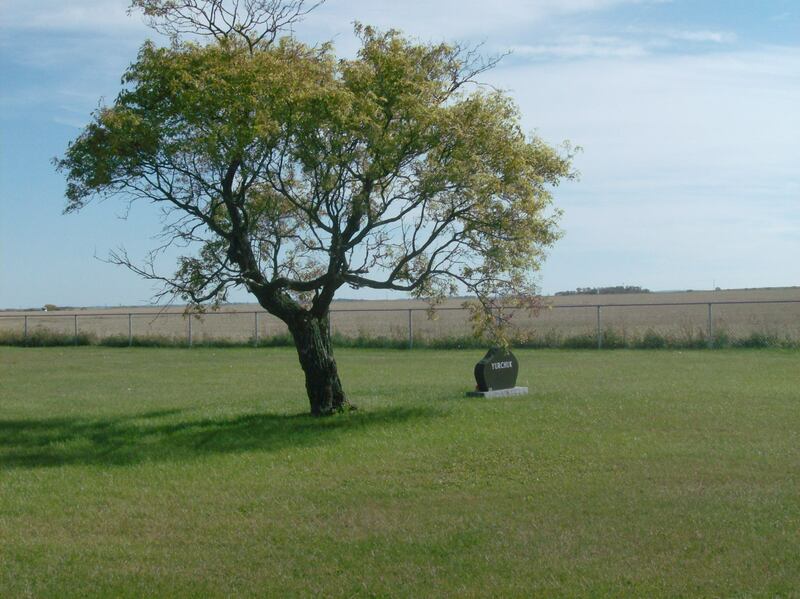 Our special place has a 360-degree panorama that encompasses three different types of prairie terrain. To the east and below the high dune is a green aspen forest against the rich dark green of the dense spruce. To the south, the forest opens into savannah with the distinct wagon trail disappearing in the distance. Behind us, to the north and west, stretches the desert, red and changing, muscular and soothing. Once at the top of the dune, each of us spoke of Linda, remembering her, letting her go. Each of us spread some of her ashes in a shallow trough in the sand. Fittingly, I added the ashes of our dear old cat Teedy in with Linda’s. The light wind that blows almost constantly across the sand will do the rest. I intend to join them someday. 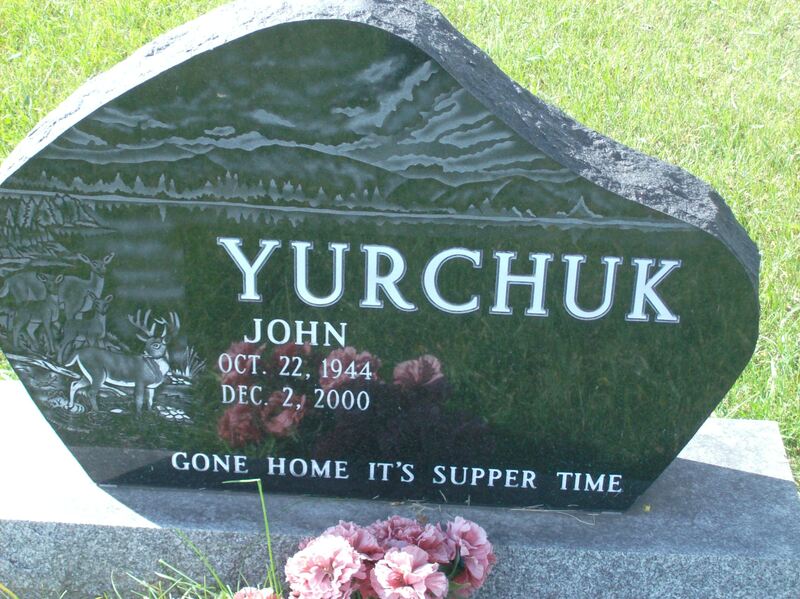 A fine place to spend eternity. The ever-changing vista. Late autumn view from our special place of the aspens, now bare and white, against the deep green of the spruce. My plan offered two possibilities to get back to the trailhead/parking lot. 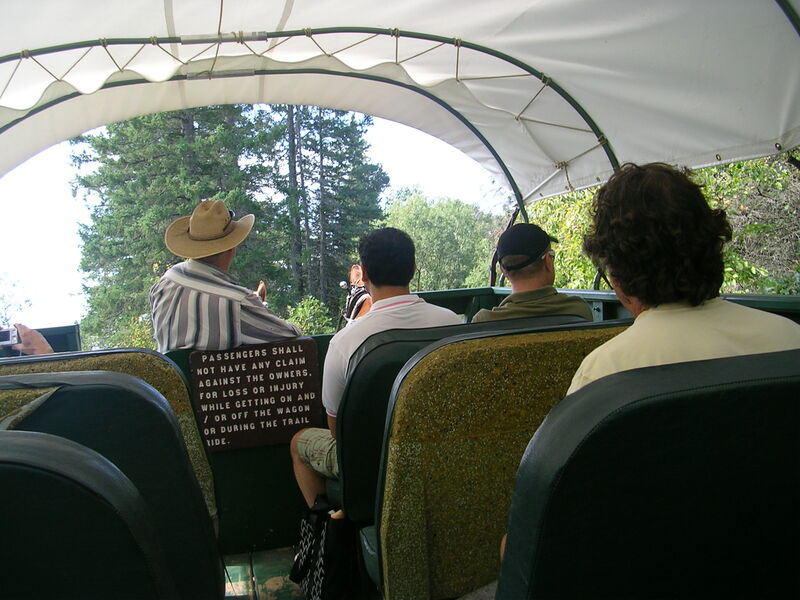 Riding on the covered wagon was a popular option in the heat. Linda’s cousin, our dear neighbour and I hiked the trail back. It was an enjoyable and familiar walk for me, made special by the company and the occasion. The hike is mainly through mixed forest and savannah with a few moderate climbs and quite enjoyable. Our return to Winnipeg featured a stop at the Summer Shack in Carberry, just north of the Spirit Sands. Linda and I feasted on their chicken burgers and chocolate milkshakes after most of our Sands hikes. The traditional was well upheld as we all had some form of chicken. For details on Spirit Sands and Summer Shack, see Day 12 of 12 Sacred Places. Kenny suggested last January that I have an event honouring Linda. “Rent the Park Theatre,” he said. The idea appealed to me but seemed a daunting and hazy affair in my state of shock. I filed it on my mental priority list for future consideration where it waited until one day in late August while driving out there somewhere when it all came together in my head. Even the name, A Celebration of Light and Linda, came to me though I didn’t know what the light part would be. On September 11, I booked the Park Theatre, an innovative conversion from movie theatre to popular multi-purpose venue, for the evening of Tuesday, November 9 for the Celebration, giving me two months to plan it. Suddenly I was an impresario! I had the first part of the evening: a screening of Stadium Trash, a 50-minute sampler of DickTool videos from the Kit edited into fast television format and shown on the big screen at the Park. Nicole and I had come up with the new Stadium Trash. The original was half as long, submitted to Video Culture Festival in Toronto in 1983 and was one of three finalists in the General category. What to do for a second half? I knew of Wild Fire, a local fire dance troupe, through Chris who does live drumming for their performances at the Winnipeg Folk Festival. He said they had a blacklight show that would work for the event. I connected with Stacy from the troupe, she “got it” and our show was on the road! Wild Fire worked up a completely original 31-minute all-blacklight show to mostly original music by Chris. I never attended their rehearsals. Instead, I tried to be a mystical muse, evoking, believing. My basic direction to Wild Fire was: create a sense of wonder and send them home talking to themselves. No pressure, kids. Using a jungle theme – minimum clothing, maximum body paint – the five-member troupe excelled. I had a show. Invitations went out to about 140 people, in Winnipeg and elsewhere. It was a hard one to turn down as we had about 110 of our closest friends at the Park for A Celebration of Light and Linda. I greeted each one personally, did a 15 minute monologue on stage (which I secretly enjoyed much too much) and presented an evening of unique entertainment, something wild, retro cool and future primitive all at once. My wonderful creative friends came together and made it possible for me to enjoy the event and my guests worry-free. Our friends enjoyed seeing Linda and I as young people, in our late 20s and early 30s, in Stadium Trash. For the Wild Fire performance, loud recorded music accompanied live by Chris and two other drummers throbbed through the Park, the darkness glowed with mystical figures inhabiting an arcane unknowable place where they held us transfixed for half an hour. Now and then during their show, I could hear Linda laughing in my head. She was having a ball, as was everyone else in the room. I know for a fact they did send some people home talking to themselves. At the Celebration, I reconnected with old friends I hadn’t seen in decades, had my picture taken with no less than FIVE of my high school friends who came to the Celebration, made new friends, young friends who keep me alive and interested and, best of all, Linda was well celebrated. The response afterwards was often astonishing. Here are a few quotes from emails I received. 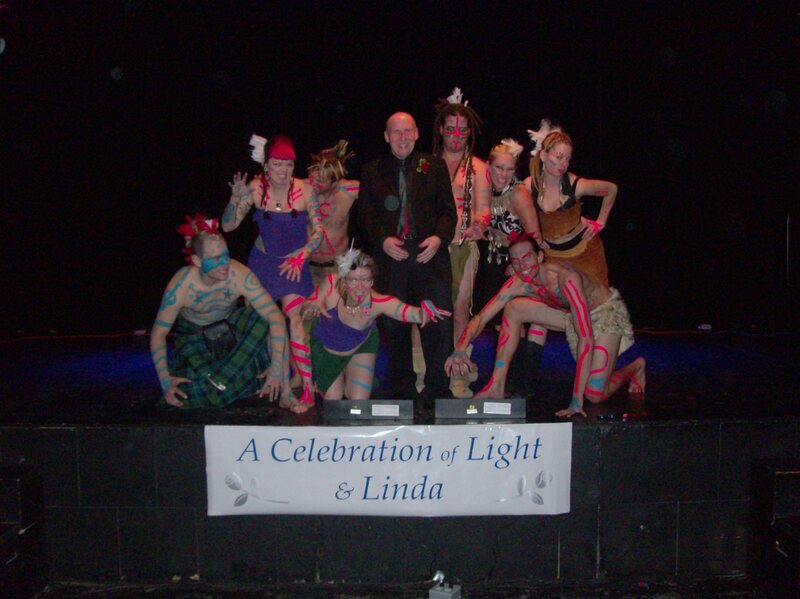 “Great commemoration of Linda and your creative project. Quirky, indeed! That we were. The Celebration was an amazing emotional high all evening for me, buoyed by the love and respect of so many friends gathered in one room for one purpose. The high lasted for days. Linda and I had often imagined the party that unites our diverse group of friends and here it was happening around me! Well documented in both still photos and video, the Celebration will soon be distilled into YouTube format. More vintage DickTool videos will be added as well. You’ve seen his name pop up here and there in my year-end review. Kenny worked with Linda for 15 years in retail and in the City of Winnipeg Film Office. They were an accomplished and amazing team. Kenny loved Linda beyond how best friends love each other. He loved her like family. It was a beautiful relationship. Loss has made Kenny and I true brothers. We have grieved together, understood and loved each other and always tried to find be happy in the warm afterglow of Linda’s life and love. Kenny is yet another Old Soul in my life. I am so blessed. Okay. After a year of consciously driving my grief process over Linda’s death and reporting it willfully and honestly here and face to face with many friends, where do I stand in the big picture? Am I floundering at the deep end of the pool or floating blissfully on the the sunny surface? We do know what to do. Grief was not new to me, as Travis pointed out and, though intensely personal, I was able to put my grief for Linda into a larger context, follow the 10 steps of grieving and push push push it all summer. Although I have found much acceptance, I have not fully resolved some of the steps but at least I’m aware of them and how they effect me. I have never been alone on this journey. Never! 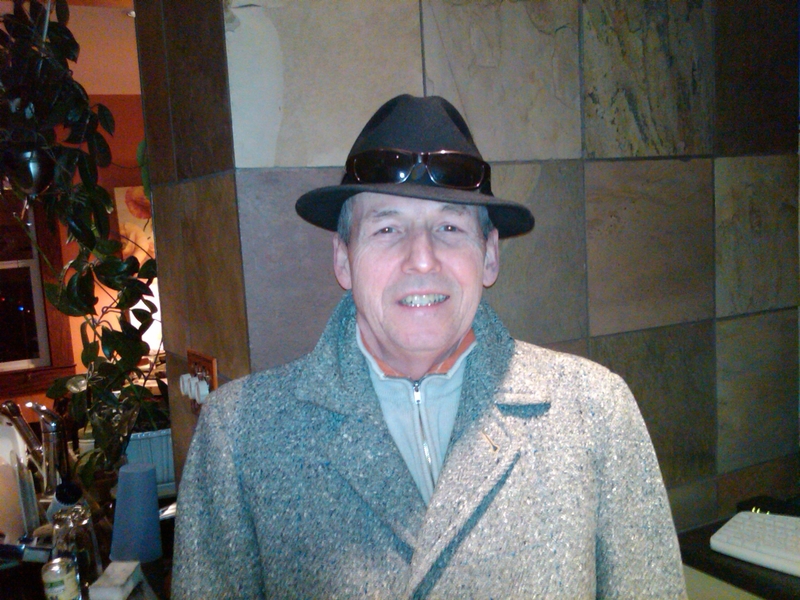 I have found enormous clarity and inner strength from the shamanic work I have practised for 16 years, from the spirits I am connected with, from my wonderful extended family (The Four – they know who they are and that I love them all dearly), from old friends and new and all of Linda’s many angels. Thanks to all of you, I am doing well. Most of all, my dear Linda watches over me. always near. Her message to me in our many communications this year has always and ever been simple and direct, though sometimes not particularily easy – be happy! Be happy! I try to live that. On Boxing Day last year, the day after Linda died, in my journal where I’d written thousands of words about the past two months, all I wrote was that old 1960s nugget: Today is the first day of the rest of my life. Its truth rang loud and clear for me every day this year. Reid’s 2010 Year-End Review: Coming December 31 featuring the Mighty Avenger and Frank Sinatra, spiritual allies, wild epitaph, massage, hot tubs, Big Beaver, Brokeback Mountain and the best and worst highways and hotels. If you subscribe to my blog I will inform you the instant it is uploaded.